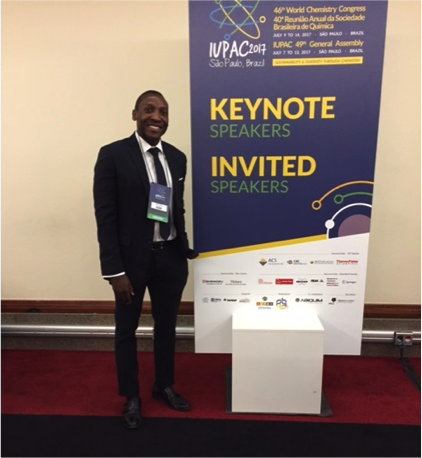 Responding to the theme of the 2017 World Chemistry Congress, “Sustainability and Diversity in Chemistry,” Mr. Wesley Laine, founder of Haiti-Philanthropy, presented “Chlorination of Haiti’s Drinking Water – A Sustainable Model for Developing Countries,” at the Congress on July 11, 2017. Mr. Laine, a 2017 graduate of Harvard Law School, described his work installing simple chlorinator devices that utilize “hockey puck” tablets of calcium hypochlorite to disinfect drinking water in the rural southeast of Haiti. Drinking water chlorination destroys most waterborne pathogens, including Vibrio cholera, the bacteria inadvertently introduced by UN peacekeepers after an earthquake that devastated Haiti in 2010. Mr. Laine noted that community involvement in maintaining chlorinators and purchasing chlorine tablets through a “chlorine bank” is key to developing a sustainable system of safe drinking water provision. Haiti-Philanthropy is supported in part by the American Chemistry Council’s Chlorine Chemistry Division.